AçaiVida® is a new and improved Açai juice powder from the Açai fruit tree, the Amazon’s “Tree of Life.” Açai berry’s fame is growing rapidly as a nutrient powerhouse. One of the most potent antioxidant foods available, Açai has been labeled nature’s most nutritious fruit. The exceptional water solubility of AçaiVida® enables its use in a much wider variety of products than ever before. It is both Kosher and GMP certified with a deliciously sweet taste. Açai is used commercially to make ice cream, jelly, liquors and as a natural food colorant. It is a popular ingredient of many functional foods and beverages from cereal and granola bars to pet food. AçaiVida® has been designed especially to meet the requirements of many formulas for a highly water soluble Açai powder with less carrier content and no filler added. Our R&D team also discovered a unique technology to reduce some of the oil content that is normally present in Açai powders. This ensures that AçaiVida® does not have any of the clumping issues that are often associated with other Açai Juice Powders. Find out what many others already have: AçaiVida® can enhance your products in a multitude of ways! The beneficial properties of AçaiVida® include flavonoids, protein, lipids, calcium, phosphorus, iron, manganese, copper, thiamine and anthocyanins. The small berry is a powerhouse of nutrients and has an almost perfect composition of essential amino acids with an abundance of valuable trace minerals and micronutrients. Açai has the ability to support healthy and normal cellular tissue growth. Consumers are increasingly discovering the benefits of Açai superfruit, with sales growing 120% in 2008 and 133% in 2009. Açai is the subject of ongoing studies and new and exciting discoveries continue to be made. Growing wild in the Amazon Rainforest on high branches of tall palm trees, Açai is found in several different places in Brazil, but the best Açai comes from the Para region, which has very rich soil and a heavy concentration of limestone, helping to improve the taste and nutrient content of the Açai grown there. Harvested indigenously, NP Nutra® works with over 140 native families in Brazil. Harvesters sail down the rivers, collecting ripe fruits in baskets from trees up to 80 feet tall. The fruit travels by boat and truck to the nearest NP Nutra® production facility where it is rapidly processed in order to avoid oxidation, creating pure, fresh AçaiVida®. 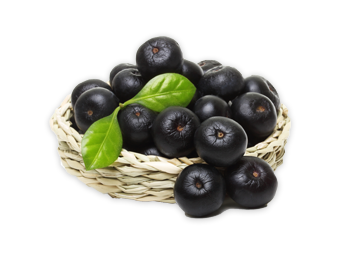 Açai berry is the richest known source of anthocyanins, potent antioxidants responsible for the deep purple to black color in fruits, vegetables and flowers. The word anthocyanin comes from two Greek words meaning “plant” and “blue.” Foods richest in anthocyanins include blueberries, red grapes, red wine, and açai berry. These powerful antioxidants help defend the body against life’s stressors. They also play a role in the body’s cell protection system. Eating a diet rich in antioxidants may support the body’s health by neutralizing free radicals. Free radicals are harmful by-products produced by the body during metabolism and by exposure to environmental pollution. By lessening the destructive power of free radicals, antioxidants may support the overall well being of the body.